Cardiovascular diseases (CVDs) are the leading causes of disability and mortality worldwide. So, it is very interesting to develop novel treatment strategies as well as drugs against CVDs. Many natural products have been proven to be safe for human consumption throughout the world, and still represent an enormous pool for the discovery and development of new drugs. In recent decades, multiple research teams investigated the possible benefits of natural products and their active components against CVDs. Our group mainly focused on screening of natural products (including ginger ), among others) to prevent or treat cardiovascular diseases. Recently we published results linking ginger and macrophage cholesterol efflux, which is an important event in CVDs . In this blog contribution, we will briefly present some highlights and major findings in our study. Ginger, the rhizome of Zingiber officinale, is a common flavoring agent for various types of food and beverages. Ginger was grown primarily in Asia and later spread to Europe. In addition to its extensive use as a spice, it also has a long history of medicinal use for various conditions, such as colds, headaches, motion sickness, nausea and vomiting, fevers, osteoarthritis, vascular conditions, digestive problems, and as an appetite stimulant. Besides, many biological activities of ginger have been documented in recent decades, including antioxidant, anti-inflammatory , anticarcinogenic and analgesic effects  among others. Epidemiological and clinical studies built a consensus that ginger and its major pungent constituents exert beneficial effects against metabolic disorders including obesity and diabetes . These findings have been supported by extensive studies in animals and in in vitro models. Generally, many medications have side effects, but the use of ginger is considered safe. Indeed, the British Herbal Compendium also documented there are no adverse effects of ginger. So, ginger may be a safe and accessible material for the prevention of chronic diseases in both developed and developing countries. Active constituents: Ginger contains a number of pungent constituents and biologically active ingredients, such as phenolics and flavonoids; new constituents are still being identified. The major pungent compounds in ginger are gingerols, which can be converted to shogaols, zingerone, and paradol. Among them, -Gingerol is the major gingerol and responsible for the characteristic taste. Aside from genetic causes, CVDs are usually associated with several risk factors, such as unbalanced cholesterol and lipoprotein levels. Cholesterol is essential for mammalian cells; excess cellular cholesterol contributes to the incidence of various diseases. The increased cholesterol accumulation in macrophages could lead to the foam cells formation, which plays a main determinant role in the occurrence and development of atherosclerosis. 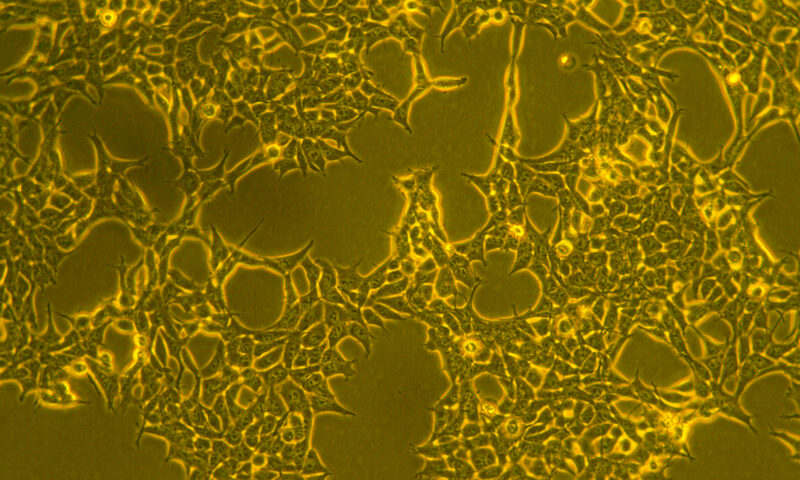 However, most cells in the body do not express pathways for catabolizing cholesterol. Therefore, the cellular cholesterol efflux process is very significant for cholesterol homeostasis. Several studies suggested that ginger and its functional ingredients are associated with a decreased risk of atherosclerosis. For example, -Gingerol was considered as a novel AT1 antagonist to regulate blood pressure and strengthen the heart in the cardiovascular system . However, it remained to be established whether ginger components influence cholesterol efflux from macrophage foam cells, which is an important strategy to prevent or treat CVDs. 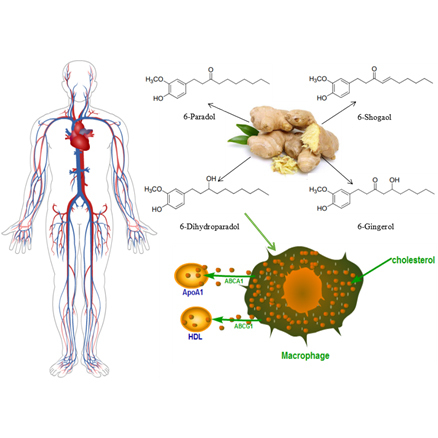 Recently we investigated the effects of 6-dihydroparadol of ginger on macrophage cholesterol efflux and this newly identified bioactive compound might contribute to understand the antiatherogenic effects of ginger. In the study, we investigated the influence of four pungent compounds of ginger (6-gingerol, 6-shogaol, 6-paradol, and 6-dihydroparadol) on macrophage cholesterol efflux and found that only 6-dihydroparadol could enhance human plasma–mediated cholesterol efflux, although these four compounds share the same chemical scaffold. Then we identified the cellular mode of action of 6-dihydroparadol. Our results showed that 6-dihydroparadol enhanced both apoA1- and human plasma-mediated cholesterol efflux from cholesterol-loaded THP-1-derived macrophages in a concentration-dependent manner and without affecting cell viability. Furthermore, 6-dihydroparadol-promoted efflux might mainly be correlated with increased ABCA1 protein expression, which is in line with increased ABCA1 mRNA levels and enhanced ABCA1 protein stability. Besides, 6-dihydroparadol also increased ABCG1 protein levels, which is not the result of altered mRNA levels, and only associated with increased protein stability. Taken together, the 6-dihydroparadol-promoted efflux might mainly be correlated with increased ABCA1 protein abundance due to elevated mRNA levels and enhanced protein stability. We further discovered that the increased ABCA1 protein stability is likely due to an effect of the proteasomal degradation pathway. Our results underline that ginger can potentially enhance macrophage cholesterol efflux and therefore may serve as good functional food/nutraceutical in the prevention or treatment of atherosclerosis. Accumulating evidence demonstrate that natural compounds are most successful sources for drug research, discovery and development. The health-promoting perspectives of ginger are well-known and Food Drug Administration (FDA) ranked it in the generally recognized as safe (GRAS) list. A large body of evidence also indicates that ginger shows negligible adverse effects even after prolonged administration. Our study showed for the first time that dietary constituents found in ginger might beneficially affect macrophage cholesterol efflux. The detailed mechanisms involved remain to be elucidated, and more conclusive evidences are needed to confirm the benefits of ginger on macrophage cholesterol efflux in animals and clinical trials. Altogether, so far, our results nevertheless underline the potential of ginger for the prevention and therapy of CVDs. D. Wang, V. Hiebl, A. Ladurner, S.L. Latkolik, F. Bucar, E.H. Heiss, et al. 6-Dihydroparadol, a Ginger Constituent, Enhances Cholesterol Efflux from THP-1-Derived Macrophages. Molecular nutrition & food research (2018) e1800011. S. Dugasani, M.R. Pichika, V.D. Nadarajah, M.K. Balijepalli, S. Tandra, J.N. Korlakunta. Comparative antioxidant and anti-inflammatory effects of -gingerol, -gingerol, -gingerol and -shogaol. Journal of ethnopharmacology 127 (2010) 515-20. D.M. Noonan, R. Benelli, A. Albini. Angiogenesis and cancer prevention: a vision. Recent results in cancer research Fortschritte der Krebsforschung Progres dans les recherches sur le cancer 174 (2007) 219-24. J. Wang, W. Ke, R. Bao, X. Hu, F. Chen. Beneficial effects of ginger Zingiber officinale Roscoe on obesity and metabolic syndrome: a review. Annals of the New York Academy of Sciences 1398 (2017) 83-98. Q. Liu, J. Liu, H. Guo, S. Sun, S. Wang, Y. Zhang, et al. -gingerol: a novel AT(1) antagonist for the treatment of cardiovascular disease. Planta medica 79 (2013) 322-6. Keywords: antiatherogenic effects of natural products, 6-gingerol bioactivities, 6-shogaol bioactivities, 6-paradol bioactivities, 6-dihydroparadol bioactivities, possible antiatherogenic effects, ginger, commonly used spice and flavoring agent, macrophage cholesterol efflux, ginger bioactivities, ABCA1 protein levels in macrophages, CVD, atherosclerosis, cholesterol, cardiovascular disease, Zingiber officinale, 6-gingerol, 6-shogaol, 6-paradol, 6-dihydroparadol, antiatherogenic effects of food ingredients.